Community Detoxification supports people to reduce or stop their use of illicit or prescribed opioids, benzodiazepines or z-hypnotics through an organized process involving key workers and prescribing doctors within the community. It can be accessed as an alternative option to in-patient residential detoxification, or as a necessary step toward meeting entry requirements for residential treatment. The initiative is overseen by an expert steering committee who are leaders in addiction services from medical, community/voluntary and research fields. It is for people who are taking prescribed or illicitly sourced benzodiazepines or people who are prescribed methadone and want support to reduce/cease their use of these substances, but can’t or don’t want to go into a residential detoxification service. It’s also for people who want to go into residential treatment and need to reduce down their use to meet entry criteria. First, the person needs to have a supportive key worker and doctor in place to help them through the process. A key worker works with people who would benefit from support in managing life issues, including changes to substance use (prescription drugs, illegal drugs, and alcohol). They can be employed in specialist projects or in mainstream health services. You can search local drug and alcohol support services through the Drugs.ie Service Directory. What is involved in community detoxification? Weekly one-to-one sessions with a key worker to receive psychosocial support. These sessions involve relapse prevention, harm reduction, and interagency care plans. An assessment by a doctor to ensure the person is suitable for community-based detoxification. Regular meetings with the doctor, to ensure the detox is suitable and working. 6 months aftercare in the community or in a residential service. 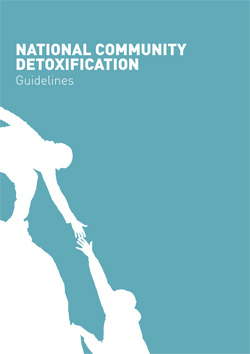 There are guidelines for methadone and benzodiazepines.The Community Detoxification Guidelines have been redeveloped based on the experiences of the Community Detox Protocols.The revised Community Detoxification Guidelines have been approved by the Community Detoxification Steering Committee. If you, or someone you know, is interested in community detoxification, contact your local drug service and/or GP for further information.